Smoking causes more than 480,000 deaths each year, and since the Surgeon General's smoking report in 1964, more than 20 million premature deaths have been linked to smoking or secondhand smoke (U.S. Department of Health and Human Services [USDHHS], 2014). Smokers are more likely to develop heart disease, stroke, and cancer, and smoking increases the risk for many age-related diseases (USDHHS, 2014). In the past 20 years, the United States has made great progress in reducing adult smoking prevalence, which decreased from 23% in 2000 to 15% in 2015 (Jamal et al., 2016). However, the smallest smoking prevalence reduction has occurred among adults 45 and older, and there has been no change for those 65 and older (Centers for Disease Control and Prevention [CDC], 2016; USDHHS, 2014). Between 2000 and 2015, past-year cigarette smoking quit attempts increased for adults younger than 45, whereas for smokers 45 and older, there was a decrease in both past-year quit attempts and successes (CDC, 2011). The limited cessation rates for older smokers is likely due to their overestimation of smoking's benefits, underestimation of their ability to quit smoking, and lack of awareness of cessation's full benefits at any age (Dawel & Antsey, 2011; Willems, Willemsen, Nagelhout, & de Vries, 2013). Further, the burden of tobacco-related disease and impairment is greatest for older adults, yet this population is often excluded from tobacco control efforts (Cataldo, Petersen, Hunter, Wang, & Sheon, 2015; Dawel & Antsey, 2011). Electronic cigarettes (e-cigarettes) entered the U.S. market in 2007 (Benowitz & Fraiman, 2017). E-cigarettes are battery-powered devices that heat and aerosolize liquids containing different levels of nicotine and flavoring agents and numerous known and unknown substances (Grana, Benowitz, & Glantz, 2014). Evidence is building that e-cigarette emissions are harmful to cardiovascular health and can include nicotine, oxidizing chemicals, and toxic compounds (Benowitz & Fraiman, 2017; Goniewicz et al., 2013). Further, ultrafine particle levels in e-cigarette vapor are comparable to those in conventional cigarette smoke (Goniewicz et al., 2013; Grana, Benowitz, et al., 2014). Although levels of toxic compounds are nine to 450 times lower in e-cigarettes than in conventional cigarette smoke, thresholds for human toxicity are unknown (Goniewicz et al., 2013; Grana, Benowitz, et al., 2014). The U.S. Preventive Services Task Force has not found enough evidence to support the claim that e-cigarettes are an effective cigarette smoking cessation tool (Syamlal, Jamal, King, & Marurek, 2016). Yet, the prevalence of e-cigarette use is increasing among older current and former cigarette smokers (King, Patel, Nguyen, & Dube, 2015). Despite the importance of risk and benefit perceptions in the decision to use tobacco products, most research on perceptions has focused on adolescents/young adults and only on conventional cigarettes (Wilson & Wang, 2017). The purpose of the current study was to investigate older smokers' attitudes and beliefs about e-cigarette use and to explore how these perceptions are associated with cigarette smoking and e-cigarette use. 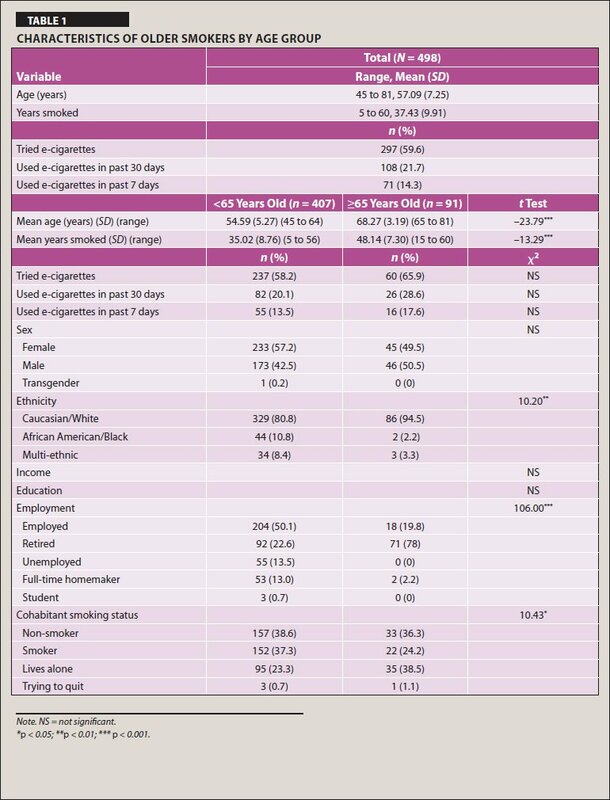 The specific aims of this national, cross-sectional survey study among current conventional cigarette smokers 45 and older were to: (a) describe e-cigarette use (ever used and current use within the past 30 days) and intent to quit cigarettes (seriously considering quitting within the next 6 months and planning to quit within the next 30 days); and (b) compare between age groups (ages <65 and ≥65) the associations among attitudes and beliefs about e-cigarettes (i.e., safety, effectiveness as a cessation tool, social acceptability, importance of flavors) and use of e-cigarettes, intention to use e-cigarettes, and intention to quit conventional cigarettes in the next 6 months. At all ages, smoking cessation can provide significant health benefits and improve length and quality of life. Yet, older adults are approximately one half as likely to attempt cessation as younger smokers (Kleykamp & Heishman, 2011). Stopping smoking is associated with reduced inflammation and oxidative stress, which are associated with a lower risk of dementia and other age-related diseases (Dawel & Antsey, 2011; USDHHS, 2014). Many older smokers are not aware of cessation's health benefits or that by quitting smoking, they could reverse many of smoking's health repercussions (Dawel & Antsey, 2011; Kerr, Watson, Tolson, Lough, & Brown, 2006). Previously, the tobacco industry has aggressively and successfully targeted older adults with deceptive marketing of “light” and “low-tar” cigarettes as healthier choices and an acceptable alternative to quitting (Cataldo & Malone, 2008). Currently, the tobacco industry is repeating that strategy with e-cigarette marketing (Grana & Ling, 2014). E-cigarette use among adults and older adults is rapidly increasing. In 1 year (2010 to 2011), the proportion of U.S. adults who had ever used an e-cigarette approximately doubled, from 3.3% to 6.2% (CDC, 2016; King, Alam, Promoff, Arrazola, & Dube, 2013). In 2011, 21.2% of current cigarette smokers had ever used an e-cigarette, compared to only 9.8% in 2010 (King et al., 2013). Further, current cigarette smokers were significantly more likely to have ever used e-cigarettes than former or never smokers (King et al., 2013). In 2015, 58.8% of U.S. adult e-cigarette users were current conventional cigarette smokers, 29.8% were former cigarette smokers, and only 11.4% were never smokers (CDC, 2016), suggesting that dual use may be a common outcome for smoking cessation attempts. Although tobacco-related health burden and health care costs are greatest for older smokers, these individuals have the lowest cigarette smoking quit rate of any age group (Cataldo et al., 2015). In summary, further research on older adults and e-cigarette use is needed because of increased prevalence of adult use; unknown short-and long-term health effects; and undetermined smoking cessation effectiveness (Grana, Benowitz, et al., 2014). This study marks the first steps in the characterization of the benefit and risk perceptions of e-cigarettes and how these perceptions impact tobacco product use among older adults. The current study is an analysis of the 2014 cross-sectional phase of the Tobacco Attitudes and Beliefs Study (TABS), which used a national sample of current and former adult tobacco users. Data were collected between July and August 2014, with a national sample of current tobacco smokers ≥45 years old (N = 498). Study participants were randomly selected from a panel of millions of respondents using QualtricsPanel, a recruitment service available through the research platform Qualtrics®. When selected, individuals received an e-mail requesting participation. Respondents logged onto the web application, and after providing consent, were screened for eligibility and included if they were a current smoker. The TABS was approved by the authors' Institutional Review Board, and participants were given a $10 gift card. Participants were asked how many times they had ever tried e-cigarettes and selected their response from a multiple choice list (i.e., never, 1 to 2 times, 3 to 10 times, etc.). They were also asked to enter how many days they had used e-cigarettes in the past 30 days (if they reported ever trying e-cigarettes) and in the past 7 days (if they reported using e-cigarettes within the past 30 days). Survey questions examining attitudes, beliefs, and perceptions were measured on Likert-type scales. The attitude and belief questionnaire items were measured on a Likert-type scale of 1 to 4, with higher values indicating greater agreement. The perception of harm questionnaire items were measured on a Likert-type scale of 1 to 5, with higher values indicating greater perceptions of harm. Participants were stratified by age into two groups: ≥45 to <65 years old and ≥65 years old. For the items in Table 1 measuring e-cigarette use, responses were dichotomized into have tried/have not tried (for whether the participant had ever tried e-cigarettes) and have used/have not used (for whether the participant had used e-cigarettes in the past 30 and/ or 7 days). Descriptive and frequency analyses were used for demographics, and exploratory bivariate analyses were used among all variables. Valid percentages from frequency analyses were reported (i.e., missing data were excluded from calculations). The Shapiro-Wilk test was used to measure normality for continuous demographic variables. The t test was used to analyze the differences in continuous demographic variables between age groups. Chi-square tests were used to test differences in categorical demographic variables between age groups. Correlations were used for nonpara-metric data to compare two ordinal variables using Spearman's rho correlation coefficient. To compare age groups, these correlation coefficients were transformed to Fisher Z scores, which were used to run Z-tests (IBM, n.d.; Sheskin, 2004; Zar, 1999). For all statistical tests, p < 0.05 was considered statistically significant. The Mann-Whitney U test was used to determine whether significant differences were present between two groups when comparing distributions of survey responses for ordinal Likert-type survey questions. All percentages reported are valid percentages, excluding missing values and “don't know” responses. Participants (N = 498) ranged in age from 45 to 81 years (mean age = 57.1, SD = 7.3 years), and mean years smoked was 37.43 years (SD = 5.4 years). When the two age groups (≥45 to <65 and ≥65 years) were compared, significant differences were found for years smoked (p < 0.001), ethnicity (p = 0.006), employment (p < 0.001), and cohabitant smoking status (p = 0.015). Compared to individuals age ≥65, individuals age <65 were less likely to be Caucasian/White, retired, and living alone; and they were more likely to live with someone who smokes (Table 1). Of current smokers, 74.9% (n = 329) stated that they would like to quit smoking conventional cigarettes, 57.8% (n = 288) were seriously considering quitting within the next 6 months, and 22.1% (n = 110) were planning to quit within the next 30 days. For e-cigarette use, 59.6% (n = 297) had used an e-cigarette at least once, 24.1% (n = 108) had used an e-cigarette within the past 30 days, and 15.8% (n = 71) had used an e-cigarette within the past 7 days. Of the smokers who had never tried e-cigarettes, 21.7% (n = 43) reported that they intended to try an e-cigarette for the first time in the next 6 months. Most current smokers (76.5%, n = 322) believed that “e-cigarettes help people quit smoking cigarettes,” more than one half (52.7%, n = 236) have considered using e-cigarettes to quit smoking conventional cigarettes, and 31.9% (n = 143) have already used them for that purpose. Although 80.6% (n = 304) agreed that “friends think it is okay to use e-cigarettes,” only 41.9% (n = 190) agreed that “friends think it is okay to use [conventional] cigarettes.” Similarly, 61.8% (n = 308) agreed “family members think it is okay to use e-cigarettes,” whereas only 27.5% (n = 137) believed that “family members think it is okay to use [conventional] cigarettes.” Although 62.4% (n = 256) of participants believed smoke from e-cigarettes is just water, 68.2% (n = 268) believed that e-cigarettes were addictive. When those who used e-cigarettes in the past 30 days (n = 108) were compared with non-users (n = 390), several significant differences emerged. Current e-cigarette users were more likely to agree that e-cigarettes help quit using cigarettes (p < 0.001), feel cleaner than smoking cigarettes (p < 0.001), and are safer than conventional cigarettes (p = 0.002). In addition, e-cigarette users were more likely to state that flavors are important (p < 0.001), and flavored e-cigarettes are better than non-flavored e-cigarettes to help quit conventional cigarettes (p = 0.005). Compared to non-users, current e-cigarette users agreed more strongly that it is okay to use e-cigarettes in the house (p = 0.004), e-cigarettes should be allowed indoors (p = 0.011), and friends and family believe e-cigarette use is acceptable (p = 0.010 and p = 0.007, respectively). Compared to users, non-users believed more strongly that e-cigarette vapor is dangerous to children (p < 0.001). Among current e-cigarette users (n = 108), the only significant difference between individuals age <65 and individuals age ≥65 was that those in the younger age group were more likely to believe that cigarettes are easier to get than e-cigarettes (p = 0.022). 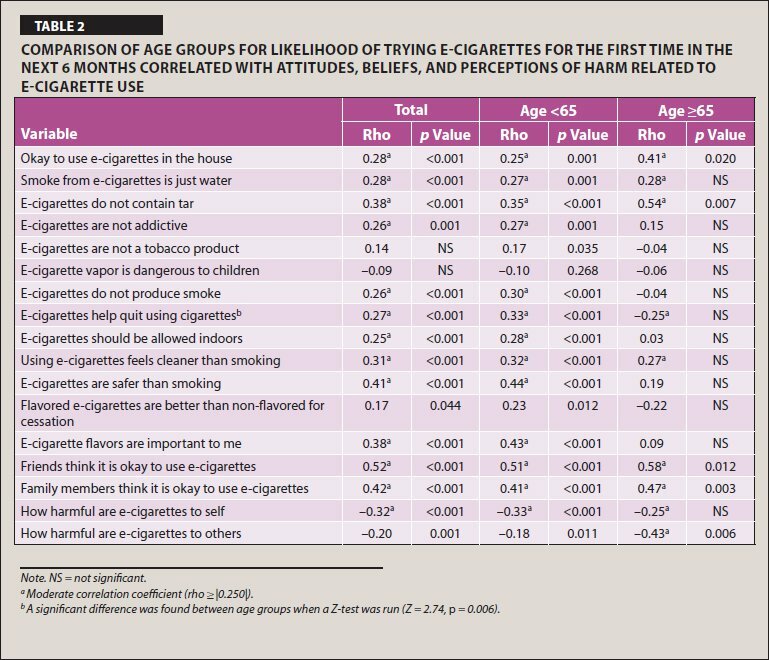 Among individuals who were not current e-cigarette users (n = 390), those ages <65 were more likely to agree that friends believe e-cigarette use is acceptable (p = 0.016), cigarettes are harmful to self (p = 0.009), and cigarettes are harmful to others (p < 0.001). Some perceptions and attitudes about e-cigarettes were significantly different between conventional cigarette smokers who were seriously considering quitting smoking in the next 6 months (n = 288) and those not considering quitting (n = 210). Individuals seriously considering quitting agreed more strongly that: e-cigarettes help quit conventional cigarettes (p = 0.044); e-cigarette flavors are important (p = 0.023); and cigarettes are harmful to self (p < 0.001) and others (p < 0.001). Smokers not seriously considering quitting smoking believed more strongly that: friends think it is okay to use cigarettes (p < 0.001), family members think it is okay to use cigarettes (p < 0.001), and cigarettes are easier to get than e-cigarettes (p = 0.035). Among participants seriously considering quitting smoking in the next 6 months, those ages <65 more strongly agreed than participants ages ≥65 that cigarettes are easier to get than e-cigarettes (p = 0.023) and that cigarettes are harmful to others (p = 0.044). Among participants not seriously considering quitting smoking in the next 6 months, those age <65 more strongly agreed than those ≥65 that cigarettes are cheaper than e-cigarettes (p = 0.036), e-cigarettes are harmful to self (p = 0.035), and cigarettes are harmful to others (p = 0.025). Among conventional cigarette smokers (n = 243), the increasing likelihood of trying e-cigarettes was significantly associated with stronger agreement on numerous items (see Table 2 for full list): e-cigarettes are safer than conventional cigarettes (ρ = 0.408, p < 0.001), flavors are important (ρ = 0.383, p < 0.001), friends and family members think it is okay to use e-cigarettes (ρ = 0.518, p < 0.001; ρ = 0.416, p = 0.001, respectively), e-cigarettes help quit using cigarettes (ρ = 0.272, p < 0.001), e-cigarettes are not addictive (ρ = 0.255, p = 0.001); and smoke from e-cigarettes is just water (ρ = 0.275, p < 0.001). As perceptions of e-cigarettes as harmful to self and others increased, the likelihood of trying e-cigarettes for the first time in the next 6 months decreased (ρ = −0.315, p < 0.001; ρ= −0.204, p = 0.001, respectively). In the examination of age group differences, there was only one significant outcome—the belief that “e-cigarettes help you quit using cigarettes” is associated with intent to try e-cigarettes within the next 6 months (Z = 2.74, p = 0.006). For the <65-year-old age group, a positive association was found (ρ = 0.332, p < 0.001), and for the ≥65-year-old age group, a negative association was found (ρ = −0.246, p = 0.198). Findings from the current study suggest that (a) most older smokers want to quit conventional cigarettes; (b) the number of older smokers who use e-cigarettes is on the rise; (c) most older e-cigarette users believe that e-cigarettes are healthier than cigarettes and are an effective tool for smoking cessation; and (d) perceived social acceptability can influence older smokers to start and maintain conventional and e-cigarette use. Although approximately 80% of older smokers in the current study reported at least one past smoking cessation “failure,” most wanted to quit smoking cigarettes in the next 6 months, and 20% planned to quit in the next 30 days. Individuals intending to quit were more likely to believe that cigarettes are harmful to themselves and to others, whereas smokers not intending to quit were more likely to believe that friends and family members think it is acceptable to smoke cigarettes. These findings support Young, Hopkins, Smith, and Hogarth's (2010) findings that a belief in harm to self and others is a motivator to quit smoking, whereas experiencing social acceptance from smoking cigarettes is a motivator to continue smoking. In addition, the current study supports evidence that a common reason for e-cigarette use is the influence of friends and family members and that the perception of e-cigarette social acceptability can influence initiation and continued use (Pepper, Ribisl, Emery, & Brewer, 2014). In the current study, 60% of older smokers had previously tried e-cigarettes, 22% were currently using them, and 35% had never tried them; these findings are consistent with recent reports of the prevalent and increasing dual use with conventional cigarettes (Grana, Popova, & Ling, 2014). In support of the current literature, findings show that current users and those who intended to use e-cigarettes believed that e-cigarettes were healthier, less addictive, cleaner, and more socially acceptable than cigarettes and that they were a safe and effective cessation aid (Pepper et al., 2014). Of note, although participants believed that e-cigarette vapor emitted was “just water,” they also believed that vapor posed a threat to the health of children and that e-cigarettes should not be advertised as a “healthier way to smoke.” These findings add support to the evidence that smokers remain skeptical and uncertain about the risks and harms related to e-cigarettes (Cataldo et al., 2015). One half of smokers who used e-cigarettes (dual users) indicated that they wanted to quit e-cigarettes. However, 17% continued using e-cigarettes because “it was too hard to quit.” A recent meta-analysis reported that use of e-cigarettes is associated with significantly lower odds of cessation than nicotine-replacement therapy or no cessation aid, and for most smokers, using e-cigarettes actually lowers the chance of successfully quitting (Kalkhoran & Glantz, 2016; Yeh, Bullen, & Glantz, 2016). Dual product use is a growing concern because it can discourage the use of evidence-based cessation methods, which in turn decreases the chances of successful cessation. This dynamic contributes to increased exposure to nicotine by allowing smokers to use e-cigarettes to avoid smoke-free air restrictions (Benowitz & Fraiman, 2017). Because of the cross-sectional design, causation cannot be established. As with most survey-based studies, there was potential for self-selection bias, and the design did not allow for a comparison of individuals who participated with those who refused to participate. All responses were self-report, but the degree of underreporting of smoking behavior compared with objective measurement has been shown to be extremely low (Yeager & Krosnick, 2010). Smokers who are ≥45 years old are considered a vulnerable population because this is the one group of smokers whose decline in smoking prevalence is small or nonexistent, yet whose rate of successful cessation is decreasing (CDC, 2011, 2016; USDHHS, 2014). In addition, the burden of tobacco-related disease and impairment is greatest for this age group, yet tobacco control and public health advocates are less likely to focus on this population (Cataldo et al., 2015; Dawel & Antsey, 2011). Therefore, additional research is needed to study this vulnerable population to help inform nurses and public policymakers about the use and safety of e-cigarettes and the effectiveness of e-cigarettes as a cessation tool. The current study provides evidence for nurses and other clinicians to inform and support the care of older smokers. For example, because most older adults in the sample maintained that e-cigarette vapor is just water, clinicians need to educate patients and the public that e-cigarette vapor contains numerous toxic substances, ultrafine particles, nicotine, and other chemicals. In addition, because more than three fourths of the sample reported that e-cigarettes are an effective aid for smoking cessation, clinicians should emphasize that research on this topic is inconclusive and that many studies have in fact found that e-cigarettes actually reduce the likelihood of successful smoking cessation. Nurses need to be informed about the benefits of smoking cessation and have the knowledge and skills to effectively use evidence-based tobacco addiction treatments. Most smokers benefit from counseling, medications, and social support to help quit; an excellent source for treatment options can be found online (Treating Tobacco Use and Dependence, a Public Health Service-sponsored Clinical Practice Guideline; access https://www.ahrq.gov/professionals/clinicians-providers/guidelines-recommendations/tobacco/index.html). Studies are needed to determine the thresholds for toxic substances found in e-cigarettes. Longitudinal studies are needed to investigate long-term cessation outcomes and to characterize (both current and former) older smokers' perceptions and use patterns over time. The current study helps establish how attitudes and beliefs about tobacco products influence older smokers' tobacco use patterns and how understanding this relationship can inform practice, education, and public policy. Centers for Disease Control and Prevention. (2011). Quitting smoking among adults— United States, 2001–2010. MMWR Morbidity and Mortality Weekly Report, 60, 1513–1519. Zar, J. (1999). Biostatistical analysis (4th ed.). Upper Saddle River, NJ: Prentice Hall. Ms. Goldberg is Clinical Research Coordinator, Ms. Dankiewicz is Adult-Gerontology Clinical Nurse Specialist, and Dr. Cataldo is Professor and Chair, Department of Physiological Nursing, Center for Tobacco Control Research and Education, Cardiovascular Research Institute, and Tobacco Center of Regulatory Science, University of California San Francisco, San Francisco, California. The authors acknowledge the dedicated work of Cheryl Dankiewicz, RN, AGCNS, whose thesis is the foundation of this article, and thank Drs. Lynda Mackin and DorAnne Donesky for their support and advice. Address correspondence to Janine K. Cataldo, PhD, RN, FAAN, Professor and Chair, Department of Physiological Nursing, University of California San Francisco, 2 Koret Way, N631, San Francisco, CA 94143; e-mail: Janine.cataldo@ucsf.edu.